Brisbane Hard Rubbish Collection & Disposal | 1-800-GOT-JUNK? Any time you do any project of any size around your property or commercial business, there's one result that's practically guaranteed: rubbish, and lots of it. Hard rubbish is the inevitable consequence of anything you do around the house, whether it's a big remodel, putting on an addition or just some simple spring cleaning. You're gonna need hard rubbish collection and disposal at some point. When that occasion arises, you don't have time to waste by shopping around. You don't have time to call different companies and consider having a dumpster dropped off or deal with your local waste collection department trying to find a way to get rid of your rubbish that complies with all their regulations. You need a company that will come right away and take away your rubbish in the most convenient, stress-free method as possible. In short, you need the experts at 1800-GOT-JUNK?. Our Brisbane hard rubbish disposal service is reinventing the wheel when it comes to junk removal. We'll come right when you call, and we're happy to help. Here's how 1800-GOT-JUNK? makes your rubbish disappear in as little as a few hours' time. First, call 1800-GOT-JUNK? and tell us a little about the nature of your job. What kind of junk it is and how much there is decides how we build our team and how many trucks we send to your location. Next, schedule a time for us to come. Want us there on the day that you call? We can make that happen. We'll show up right on time, and then it's goodbye junk, hello relief. You'll forget all about your hard rubbish problem when you see our shiny, branded trucks pulling away from your property. The best part? You don't have to lift a finger. Just show us what we're up against, simply point, and junk disappears. Brisbane's Best Hard Rubbish Disposal Provider! Why are we your favorite local junk removal and Brisbane hard rubbish collection company? The reasons our customers can't get enough of our convenient, full-service junk removal services are too numerous to list, but here are just a few. We only have the best junk haulers in Brisbane on our crews. 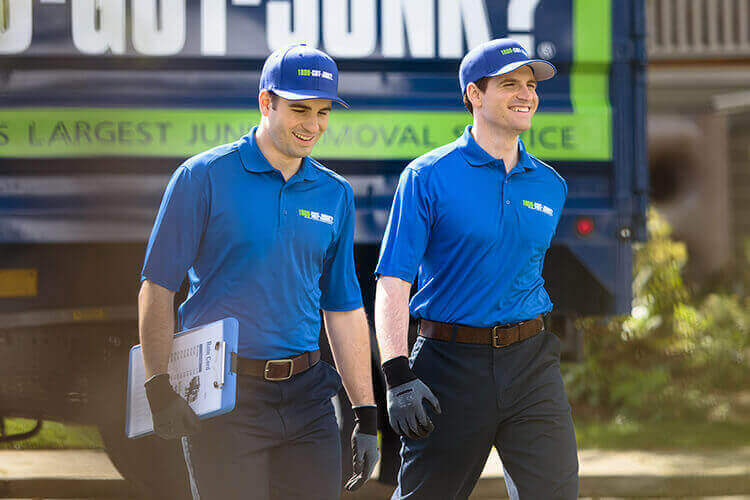 When you see our friendly, uniformed team walking up to your door, you'll know you're in the capable hands of the experts at 1800-GOT-JUNK? We make it easy for you to use us again and again with our transparent, up-front rates. You pay one flat price for the amount of space your junk takes up in our trucks, so there's no difference in calling us once or calling us 10 times for the same amount of hard rubbish. We'll take pretty much any rubbish you want gone. As long as it's non-hazardous and can be handled by a team of able-bodied junk haulers, we'll take it off your hands. This means furniture, appliances, yard waste, construction debris and more: if we can handle it, we will. But wait, I'm sure you're thinking to yourself. What do you do with my rubbish after you haul it off of my property? At 1800-GOT-JUNK? we realize the role we play in being environmentally responsible, for the simple fact that we're in your neighbourhood and we share your community. That's why we go the extra mile to ensure that as much of the junk that we take away as possible ends up donated or recycled to avoid the landfills. If you're mulling your options about where to look for Brisbane hard rubbish collection and disposal, make the choice that customers have been trusting since 1989. 1800-GOT-JUNK? can get rid of your hard rubbish, and we can do it as conveniently as possible.